The Battle of Fort Henry was fought on February 6, 1862, in western Tennessee. On February 4 and February 5, Grant landed two divisions just north of Fort Henry on the Tennessee River. His plan was to advance upon the fort on February 6 while it was being simultaneously attacked by United States Navy gunboats commanded by Flag Officer Andrew Hull Foote. A combination of effective naval gunfire and poor siting of the fort, almost completely inundated by rising river waters, caused its commander, Brig. Gen. Lloyd Tilghman, to surrender to Foote before the Army arrived. The surrender of Fort Henry opened the Tennessee River to Union traffic past the Alabama border, which was demonstrated by a "timberclad" raid of wooden ships from February 6 through February 12, which destroyed Confederate shipping and railroad bridges. Grant's army then proceeded overland 12 miles to the bloody Battle of Fort Donelson. April 12, 2011 marks the 150th anniversary of the bombardment of Fort Sumter in Charleston Harbor, South Carolina. The attack on the fort by shore-based rebel artillery initiated hostilities between the newly born Confederate States of America and the Union. (USRC-the forerunner of the US Coast Guard) Harriet Lane, now in naval service, occurred on April 11, 1861. During this foray the Harriet Lane confronted a steamship named the Nashville. Since the merchantman showed no colors, Captain Faunce of the Harriet Lane ordered a 32-pounder to be fired over her bow. The Nashville quickly raised the American Flag and she was allowed to continue into the Charleston harbor. Later the Nashville was seized by the Confederacy and ultimately became a Confederate cruiser. The Harriet Lane never got very close to Fort Sumter and had to withdraw due to the intense bombardment from the Confederate artillery onshore. The warning shot by the Harriet Lane across the Nashville’s bow is considered the first Naval shot of the Civil War. May 1863 -- The Vicksburg Campaign begins. the fortified city considered essential to the Union's plans to regain control of the Mississippi River. Confederate General John Pemberton surrendered, giving up the city and 30,000 men. The capture of Port Hudson, Louisiana, shortly thereafter placed the entire Mississippi River in Union hands. The Confederacy was split in two. It is interesting that one of our Camp ancestors fought in the Battle of Vicksburg. Pvt. David D. Franklin was among the 30,000 Confederate Troops captured there. A year later, he would join the 3rd U.S. Volunteer Infantry, serving on the western fronier. which happened that day by resolution of the Second Continental Congress in 1777. In 1916, Woodrow Wilson issued a proclamation that officially established June 14 as Flag Day; in August 1949, an Act of Congress established National Flag Day. and by June 1894 300,000 children gathered in parks throughout Chicago to celebrate the day. Another claim is made on behalf of William T. Kerr of Collier, PA, who founded the American Flag Day Association of Western Pennsylvania in 1888. He became that organization's national chairman one year later, and served as such for fifty years. He attended Truman's 1949 signing of the Act of Congress, which formally established the holiday. To George Morris of Hartford, Conn., is popularly given the credit of suggesting "Flag Day,"
carrying out a program of a patriotic order, praying for the success of the Federal arms and the preservation of the Union”. For many years during the mid-nineteenth century Miss Carrie Shead ran a school for young ladies in the family home on the Chambersburg Pike, just west of the sleepy little town of Gettysburg in southern central Pennsylvania. Then, on the afternoon of July 1, 1863, the Battle of Gettysburg engulfed her home, as Union forces began to fall back from Seminary Ridge, just to the west. As the tired troops retreated on Gettysburg, some of them took shelter in the Shead house. One such was Col. Charles Wheelock of the 97th New York. but the Rebels – and Miss Shead – followed him. Cornering the good colonel, a Confederate sergeant demanded that Wheelock give up his sword. The latter refused. Before the sergeant could take it, a second group of Rebels came thundering down the stairs, herding some Yankee prisoners before them. After a moment's confusion the sergeant renewed his demand for Wheelock's sword. But it was gone, taken, Wheelock said, by one of the other Confederate soldiers. The sergeant went off angrily, deprived of his precious souvenir. Wheelock was later herded out of the house with the other prisoners. Soon after, Wheelock managed to escape. Several days later he returned to the Shead house to pay his compliments to Carrie and recover his sword, which she had hidden under her skirt. The Shead house was crowded that day in July. Pvt. Asa S. Hardman of the 3rd Indiana Cavalry had fought all morning along Seminary Ridge. As was the case with many another soldier that afternoon, the Shead house provided him with temporary shelter. He too was taken prisoner, but unlike Wheelock, was unable to elude his captors. Eventually exchanged, Hardman also paid a return visit to the Sheads, so that he could marry Carrie's sister Louisa. ".... Tell mother she must not worry......"
Nineteen New York infantry regiments were present at the first Battle of Bull Run. One of them, the 18th New York Infantry, was made up of soldiers recruited in Albany and Schenectady counties. The 12th and 25th New York State Militia were also filled with local men, and defended Washington D.C. during the battle at "Fort Albany," a fort built on Arlington Heights on the Virginia side of the Potomac River. 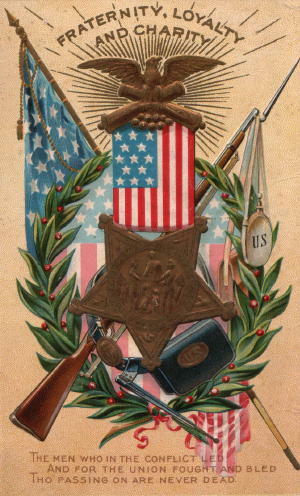 John Dempsey, a store clerk in Albany, enlisted as a private in the 18th New York State Infantry. "My dear sister: The battle of Bull Run was as hard fought as it was discouraging. You ask, how I stood it; I will tell you. When we started from here, we had our haversack (which was soon emptied), blanket, canteen and a rifle. Most of the boys threw away their blankets, and some their canteens; but I thought the blanket came very good at night, and the canteen when I was thirsty, so I brought them all home with me -- to this camp I mean, for it is the best home I have had since I left old Albany. Don't think that I complain, for I do not intend to complain of anything necessary to a soldier's life. My greatest desire is to do my duty. I did not expect, before me, a path strewn with roses, so I meet no disappointments. Tell mother she must not worry, nor have any anxiety about me. I shall endeavor to take the best care of myself I possibly can. Tell her to be of good cheer, for I am here in a good cause." Lt. John Dempsey died of wounds he received in action near Petersburg, Va., in 1865. The Henry, an advanced repeating rifle saw limited but effective use as the war drew to a close. The Confederates referred to it as "That damn Yankee rifle they load up on Sunday and fire all week." Five Forks and Sayler's Creek. The "Hornet's Nest" at Shiloh was named by Southern troops because so many bullets were buzzing in the air. The fierce defenses of Union Hurlbut, Wallace and Prentiss held for nearly six hours before being overrun by Rebels. General Robert E. Lee decided to surround the force and capture it. He divided his army into four columns, three of which converged upon and invested Harpers Ferry. A.P. Hill's division arrived in time to save Lee's army from near-defeat at Sharpsburg. was once denied practicing law in New York because of his race. from Brown's Ferry on the Tennessee River with a simultaneous advance up Lookout Valley, securing the Kelley's Ferry Road. Bridgeport through Lookout Valley towards Brown's Ferry from the south. The Federals now had their window to the outside and could receive supplies, weapons, ammunition, and reinforcements via the Cracker Line. Relatively few night engagements occurred during the Civil War; Wauhatchie is one of the most significant. steamed up the Broad River in transports to cut the Charleston & Savannah Railroad near Pocatalico, GA.
and militia under Colonel Charles J. Colcock, with a battery of seven guns across the road. at Honey Hill, GA.
and the Confederates were too well entrenched to be dislodged. withdrawing to his transports at Boyd's Neck, having lost 89 men killed, 629 wounded, and 28 missing. The Confederate casualties amounted to 8 killed and 39 wounded. 1st Lt. O.W. Bennett was awarded the Medal of Honor. Mr. Nelson Biddell, a merchant of Philadelphia, who married his wife in Savannah, Ga., and who left there on the 2d, has just arrived here by way of Nashville, Bowling Green and Louisville. I have had a long conversation with him, as he accurately observed the places through which he passed. Mr. Biddell had great difficulty in getting out of Savannah, having labored faithfully, but in vain, to do so for several months. temporarily, on its way to Virginia. During his residence in Savannah, there were two or three drafts for soldiers, and he was compelled to furnish two substitutes for the rebel army, one of whom, an ex-lumber merchant of Maine, was the most violent Secessionist in the place. The South, he believes, has all the force in the field that it can possibly raise; having made the most determined and persistent efforts to furnish men and money for the cause. The people have been most severely taxed, and those at all suspected of Union sentiments or proclivities have been forced to contribute enormous sums. Many of the merchants and professional men have been impoverished by the exactions of the "Confederacy." The strongest and boldest Union man is Hon. John E. Ward, formerly our Minister to China, and he is dreadfully persecuted by the rebels, who have arrested him at least twenty times while attempting to escape, robbed him of his entire property, and some $400,660, and threatened several times to hang him. Mr. Ward says they can kill him if they like, but that he will never surrender his allegiance to the Federal Government, or cease to detest and denounce the miserable abortion known as the Southern Confederacy. He is very anxious to go north, but is so closely watched that he cannot escape. Mr. Biddell thinks it not at all improbable that Mr. Ward will be assassinated in Savannah, unless he succeeds in getting out of the State. The greatest excitement, Mr. Biddell says, reigned throughout the South on the subject of the war, and the women of Savannah daily practiced with firearms, to perfect themselves in their use. Everywhere one hears the most bitter and violent denunciations of the Federal Government, and of President Lincoln; and the people declare they will resist to the death all attempts to subjugate them. They declare the Administration designs this as an Abolition war, and that they will perish before they surrender their slaves. Many of these ultra and hostile opinions, however, Mr. B. believes, are expressed to disguise the real sentiments of those who utter them; and he says he has known men, publicly the most superlative fire-eaters, to state privately their strong attachment to the Union, and their secret hope that our arms would soon be successful. He thinks that even in Savannah the presence of the Federal army would be hailed with joy by a majority of the people. Savannah, like all the Southern towns through which Mr. Biddell passed, is entirely barren of business, and complaints are rife of the stagnation of trade and the scarcity of money. Mr. B. had the greatest difficulty in obtaining $500 in gold, although his brother-in-law had $90,000 of Georgia currency in the Planters' Bank, and when he did procure coin, was compelled to pay fifty cents premium for it.